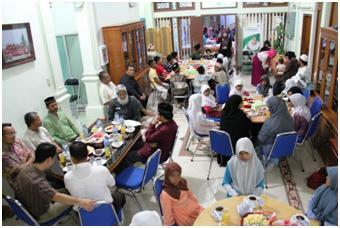 Muslim Aid Vice Chairman, Dr Suhaib Hasan visited the Indonesia Field Office in August 2012 during the holy month of Ramadan. He joined an iftar event organised for orphan and needy children by Muslim Aid and distributed Ramadan food packages to the beneficiaries. He later visited Muslim Aid Indonesia’s Aceh Economic Development Financing Facility (AEDFF) in the Bireuen District. During his visit, Dr Suhaib also went to see the Pump House station in Lampaseh, Banda Aceh, which is part of the flood mitigation project funded by the World Bank Multi Donor Fund for Water & Sanitation in Aceh Besar along with Muslim Aid’s housing projects for the tsunami victims which has been funded by Oxfam and the Asian Development Bank.